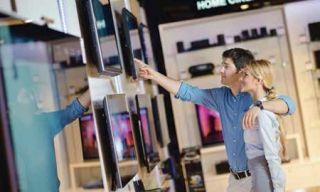 Flat-panels, projectors, and their control method can be price-sensitive. But that selection can bring a whole installation to a halt or not serve an intended goal when they will not work with the way a system is set up. We’ve all heard the horror stories. A purchase order with twenty 55-inch LCD flat-panel displays is sent to a CFO for approval. The displays are to be used throughout the corporate campus for digital signage during “normal working hours” of the company. The flat-panel brand happens to be the same respected brand the CFO has at home in the family room, and recently saw on sale when stocking up on motor oil, diapers, and Hot Pockets at the local shopping club. S/he knows the price was less than what otherwise appears to be price gouging on the purchase order. AV integrators have to make their margin someplace, right? But not on this CFO’s watch. The LCDs are scratched from the list, and are purchased off the shopping club floor, and a lot of money was saved. Long live the bottom-line. Until. The CFO didn’t realize that s/he, or more likely someone else was going to have to run around the campus and manually turn on the 20 displays in the morning and turn them off before leaving at night. Sure, there is an IR remote, but the RS-232 that would have allowed the displays to be controlled through the AV control system didn’t come on the consumer model. Control through IP (e.g., Telnet or SSH) is also available on some displays and provides a robust method of control. While passing by the lunchroom the CFO sees that the corporate messaging on the displays have been tuned into “Gilligan’s Island,” because the consumer model didn’t have the measures usually built into commercial displays to prevent channel surfing and volume control. After a couple of months of diligently managing the on/off, most displays got left on 24/7 and the “half-life” quickly became no-life. And come to find out, the extended warranty that seemed to make during checkout for the consumer model was made null-and-void because it was used in a commercial environment. Commercial displays are engineered with thermal characteristics in mind to withstand 24/7 operating hours and come with appropriate warranties. As with any company-wide system, use-case and connectivity are key considerations. Whether buying five flat panel displays or 50, purchasing a panel specifically designed for commercial applications will provide flexibility to expand the applications as company needs evolve. Digital signage can start simply with a set loop of information and expand to dynamic messaging that can increase productivity and keep employees connected. Some will argue that a high-end consumer flat panel is adequate for a conference room where the use is limited. This might be the case for some, but it is a good idea to make sure that all of the potential uses have been thoroughly thought through. A display that might only be used for a PowerPoint presentation today might need to be used to conference-in a client tomorrow. For more AV Technology Remedies, download our free ebook.